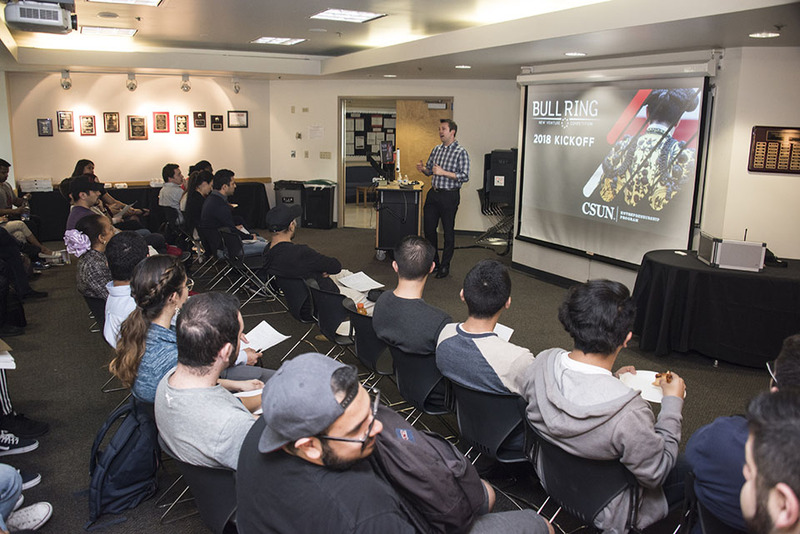 Students across colleges attended the CSUN Bull Ring New Venture Competition kickoff event on Feb. 6. Photo by Lee Choo. 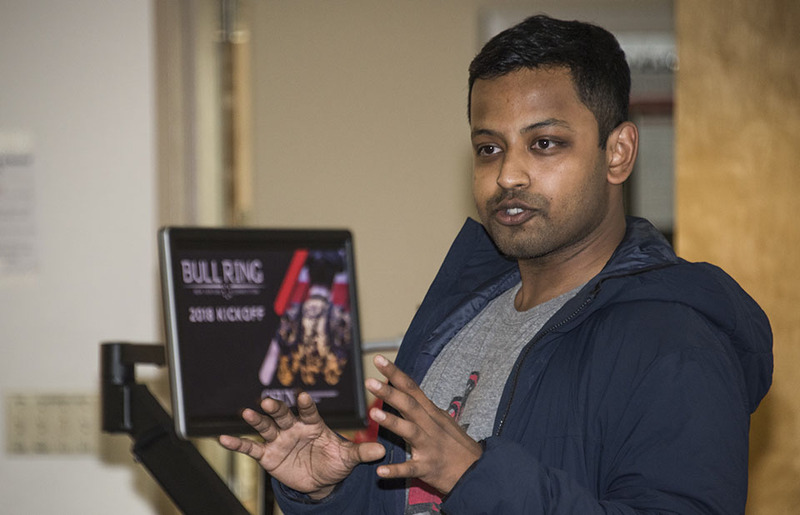 The first Bull Ring workshop featured Eric Rose, a product innovation and management consultant, who talked to students about customer discovery research. Photo by Lee Choo. Ismail Hossain, an organic chemistry graduate student, presented his business idea during the Bull Ring kickoff event. Photo by Lee Choo. The annual California State University, Northridge Bull Ring New Venture Competition has returned to campus this spring for the third time. The 2018 contest, hosted by the David Nazarian College of Business and Economics, started with a kickoff event Feb. 6 at Bookstein Hall, and participants may apply until March 11. The contest includes two selection phases. A jury of 10 entrepreneurs and industry leaders will select 20 teams to present their work at the semifinals on April 3, from 3 to 6 p.m. in the Jack and Florence Ferman Presentation Room at the Delmar T. Oviatt Library. The event will be set up as a trade show: each team will man a booth presenting, pitching their startup ideas and products to guests and judges. Audience members may vote to send one team to the finals. Five teams will reach the Bull Ring finals on April 24, from 3 to 6 p.m. in the University Student Union’s Grand Salon. During the event — modeled after the hit ABC TV show Shark Tank — finalists must present an on-stage pitch of their business and participate in a Q&A session. The winning team will earn a $20,000 grand prize — and $10,000 for the second-place team and $5,000 for third — and all semifinalists have the chance to win $250 in cash and $30,000 of in-kind prizes. “The Bull Ring provides a platform for entrepreneurial-minded students from across the university to join a community, receive mentoring and support, and, ultimately, move their new venture ideas to the next level,” said Ryan Holbrook, director of the Nazarian College Entrepreneurship Program. On their way to the finish line, participants will get support from mentors and coaches to polish their startup ideas and gain access to potential investors. Three workshops support the teams in different aspects of business creation. The Feb. 6 kickoff event featured guest speaker Eric P. Rose, a product innovation and management consultant. Rose supports businesses in developing new product ideas and moving them into the marketplace. His presentation included advice on how to successfully conduct customer discovery research. “It is important to ask the right people the right questions, in order to get insight into what product benefits the market values the most,” Rose said. The kickoff event also allowed CSUN students to share their business ideas and recruit potential team members. Ismail Hossain, an organic chemistry graduate student and teaching assistant in the Department of Chemistry and Biochemistry, touted his idea to create a device that makes waking up in the morning easier by combining lights, scents and music. “I am looking for engineers who want to join my team. I already bought all the parts — I just need help with the assembly,” Hossain said. Wandoly Juarez, a business management senior, used the event to network and explore project opportunities. “I want to see what I can bring to the table. It’s a good experience to start off and dip my toes into entrepreneurship,” she said. On Feb. 20, a second workshop will provide a primer on intellectual property. The third workshop, on March 6, will give students advice on how to successfully pitch to investors. “It’s never been a better time to be an entrepreneur at CSUN, with all the opportunities and resources available,” Holbrook said. 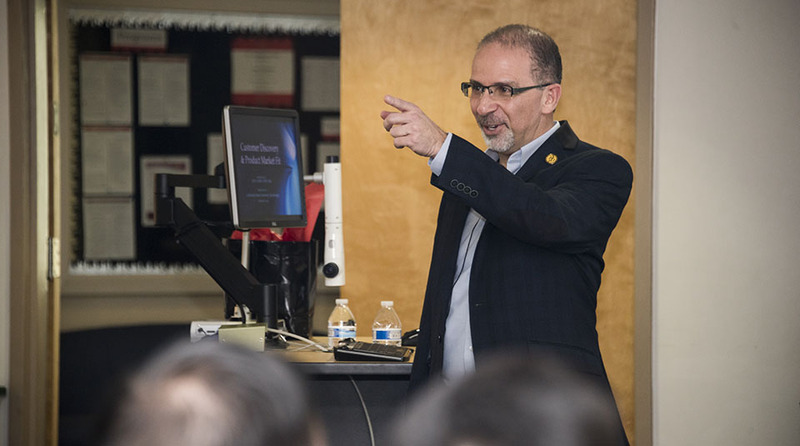 CSUN’s David Nazarian College of Business and Economics has been at the forefront of entrepreneurship and innovation. Students can sharpen their entrepreneurial skills with programs such as the Los Angeles Cleantech Incubator, an on-campus incubator that promotes innovation and entrepreneurship; VARJAM, a virtual and augmented reality competition; and Fast Pitch, a venture competition. Students interested in the CSUN Bull Ring New Venture Competition can apply via the Bull Ring Canvas page by using the code FLXHED. The competition is open to all current CSUN students and fall 2017 graduates. Each team must consist of at least two people. Non-students are welcome to participate — however, at least 50 percent of the team members must be enrolled as CSUN students. Each team must submit a 10- to 25-page slide deck or a five- to seven-page business plan, and a video no longer than two minutes. For complete guidelines, please go to the CSUN Bull Ring website.